Considering the lifestyle these days, being in shape is extremely important but it may not always be possible to go to the gym or a fitness center. Instead a few exercise equipment at home can do wonders. Burning calories on a treadmill can help lose weight really fast and a good treadmill is all you need! The ProForm Pro 2000 is loaded with features like 8” display, powerful 3.25 CHP Mach Z motor, built-in workouts, easy incline-decline controls, speed controls up to 12MPH, workout fan and a compatible music port. Ergonomically designed, this treadmill is perfectly modeled for maximizing your workout sessions. A noisy treadmill is the last thing you need at home. But this model of Proform is not noisy at all and you can comfortably do your workout without having to worry about wrecking the peace of others around you. Also, when it comes to space it scores quite high. It folds up to 70%, which is quite reasonable and enough for saving space. Once folded it is easy to put away in one corner, though it is quite heavy to move around frequently. The ProForm Pro 2000 scores most of its points with in-built workout features. It comes with 24 workout programs, including 6 each of calorie-burn workouts, incline workouts, intensity workouts and speed workouts. Furthermore, the wide range of speed, incline and decline also makes it easier to choose the intensity of workout. Speed range of up to 12 MPH, incline up to 15% and decline up to -3% helps in burning more calories and making your workout sessions more intense and exciting. Without a good and strong motor, any treadmill is useless since the durability and efficiency of the machine is dependent on it. This ProForm has a powerful internal 3.25 CHP Mach Z commercial pro motor, which gives this machine power-driven beastly energy. This high-end motor makes it long-lasting and robust. The best part about the ProForm Pro 2000 is the effortlessness in using it. With just a single touch you can control the speed and incline levels to increase or decrease your workout intensity. Furthermore, while you are walking or jogging it is easier to control the speed if you want to immediately slowdown in case of any emergency. However, it loses points in assembly. While some may find it easy to assemble, most will however, find it extremely tedious as it may need a good 3-4 hours. Even though the user manual has clear instructions, you may need assistance in assembling it perfectly owing to the size and weight of the entire unit. The most important aspect of any treadmill is its running belt and deck. This model no. 2000 of ProForm has a 20” x 60” long belt, which can easily accommodate users of different heights. If you’re tall you don’t have to worry about your feet steeping off the belt. In addition, the belt has full surface suspension cushioning, which acts as an excellent absorbent. This in turn decreases the impact on joints and makes workout comfortable and less stressful. Whether you are an avid walker or jogger or have just begun to using a treadmill, this is just the ideal equipment. This fitness machine comes with an in-built 8” automatic fan, which cools while exercising. Treadmills are no fun unless you have good music accompanying it. This beast features a 3.0 sound system and an iPod compatibility music port to add a spin of relaxation while you are slogging it out on the belt. However, the iFit Live feature is a complete let down and just not satisfactory. It does not work as claimed, needs plenty of fixes and is riddled with ridiculous bugs. Easy to assemble, built-in workout programs, wide range of incline-decline controls, powerful motor, workout fan, good display, well-built with an iPod port. Quite heavy, I-Fit app does not work properly as claimed, customer service is not competent and 100% satisfactory. 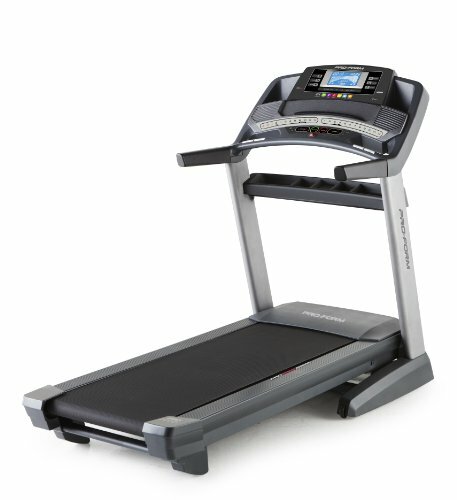 If this is your first treadmill and you do not have prior experience in purchasing a treadmill, then selecting this particular model wouldn’t be a bad idea after all. Its biggest plus points are the in-built workout programs, long deck with cushioned surface, one touch control buttons for speed and incline, a powerful motor, great display and easy storage. Even though it falls short in some areas like its weight making it difficult for portability and the iFit technology, it still packs in a lot of goodies.